We will install U.S. wide!! We are giving you a FREE Glass Putter with the installation of one of our putting greens. Grasshoppers Landscaping LLC. can design and install customized putting greens, tee areas, and landscape grasses. We can install a custom green if you are a home owner, corporation or small business, driving range. Whether it's for indoors or out, Grasshoppers can fill your needs, GUARANTEED! 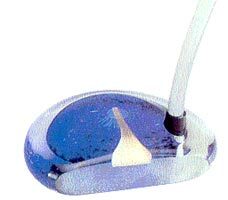 We also are involved with selling PUTTERS of GLASS. The turf we use is so realistic that you won't be able to tell if it's real or not. It's almost maintenance free, along with the best warranty available in the business! The turf is made of the finest polypropylene tufts, and they are both UV and wear warranted for 5 years (with normal wear). The infill system uses a specially graded round silica sand that will always drain well, and never compact. The base we use is a compactable limestone or slag sand; therefore it is not a permanent fixture, so no permits are necessary. We roll and tamp the base so smoothly that we recommend you putt on it before it is completed, in order to find the breaks and rolls, and set your pin locations. We can always increase or decrease the breaks this way, and you get the customized putting green that you want. We follow a 5-step installation process that takes approximately 8 to 10 hours for a 12' X 20' green. That means that we can start an installation in the morning, and you can be putting on it that same evening, or early next morning! Click on each link to see a picture of that step. First, we outline the spot that you pick on your lawn. 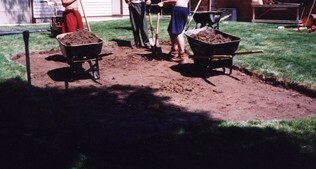 Next, we use a sod cutter and shovels to remove all the grass and the top two to four inches of dirt. When the refuse is cleared, a geo-textile is cut in the shape of the green and laid down to prevent plants from penetrating into the base of the green. On top of this, limestone screenings are brought in to make a solid base for the green. These screenings are leveled, packed, and contoured to your specifications. We can make the green break virtually any place and any direction that you desire. Now it is time to set the cups. They are cemented in for stability and leveled to ensure a true play. Our carpet is set down on the base and the cups are marked. 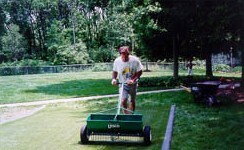 The patented infill mixture is prepared and spread onto the green evenly with a drop spreader. It is then brushed into the turf. This process is repeated until the infill almost completely covers the fibers of the turf. 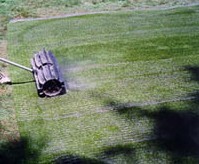 The green is then sprayed with water and rolled once again. The carpet is trimmed around the cups, and last, but not least, the flags are put in, and you can putt until your heart is content! To see pictures of some of our finished greens, click here.